Tungsten rings, whether as a wedding band or a general fashion accessory, have traditionally been firmly in the domain of men, when it comes to who wears them. However, as the market has grown and the positive aspects of tungsten rings have become known around the world, it was inevitable that women’s tungsten rings would enter the market at some point. Not only are tungsten rings for women widely available, they are proving hugely popular, too. That said, there is not the range of styles and ring designs available for women that there is for men. What is the reason behind this? The jewelry industry, not to mention opinion around what is fashionable and what isn’t, is changing almost on a daily basis. In the grand scheme of things, however, things take time to evolve. 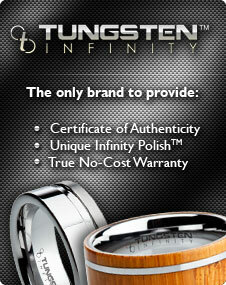 As tungsten rings have primarily been a men’s market, almost all of the products available have been thicker rings. Women, of course, tend to have smaller hands than men, and generally choose thinner rings consequently. At the same time, women’s rings are trending towards being bigger, but not up to 6-8mm as is commonly seen with many men’s tungsten rings. Making a tungsten ring smaller takes a great deal of artisanship to ensure a top quality product, and the fact is that not many have been able to master it yet. However, it is unlikely that we will ever see women’s tungsten rings as thin as the 2mm that can be found with gold and silver rings. Although women will surely in the future choose tungsten jewelry as an accessory in much the same way men do now, at present tungsten rings for women are much more about functionality. Tungsten engagement rings and wedding bands would be the perfect examples of this. Better yet, because women’s rings are getting bigger, matching sets of tungsten wedding bands can be purchased, with little or no difference in the sizing between the women’s and men’s bands. For men who want to treat their woman with precious stones, there is also the potential for setting diamonds and others into tungsten, to add a touch of further romance. In addition, tungsten rings for women are available in custom designs, and engraving can also be carried out as it normally would be on a man’s ring.